1 of 1 In a large nonstick skillet, stir together nectarines, cherries, sugar, lemon juice and lemon zest. Simmer over medium-high heat for 3 minutes. 1 of 2 In a large bowl, whisk flour, sugar, chai seasoning, baking powder, baking soda and salt. Stir in buttermilk and melted butter until a sticky dough forms. 2 of 2 Dollop heaping tablespoonfuls of the dough over the simmering fruit. Cover tightly and simmer on medium-low for 25 minutes. Cool for at least 15 minutes. 1 of 2 In a large bowl, beat the cream, sugar and chai seasoning until stiff peaks form. 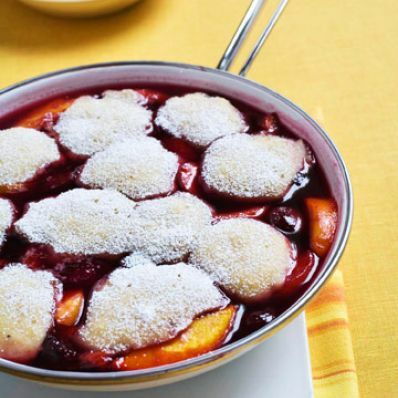 2 of 2 To serve, dust with confectioners sugar and spoon dumplings and fruit into individual bowls. Serve with whipped cream alongside.